Thai Temple Fly Casino is a new progressive jackpot slot game that is sure elevate your winnings as you enjoy a Thai themed adventure. 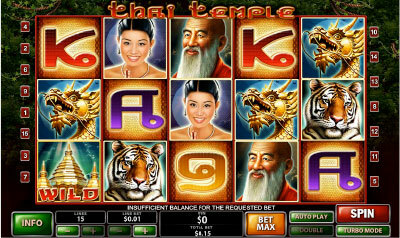 Thai Temple features 5 reels and 15 playlines along with a progressive jackpot that is activated with elevated wagers. Fly Casino Progressive Jackpot: Get 5 Wilds and you will be playing for one of several progressive jackpots based on your bet amount. A fun new game to enjoy at Fly Casino – Play today! Fly Casino is pleased to bring you Secrets of the Amazon! This 5-reel, 20 payline game at Fly Online Casino can awarded you with a sky-high 50,000X top prize. Fly into the casino today and take a crack at some huge winnings! 100% VALUE MONDAY! From 00:00GMT until 23:59 GMT, all members are invited to receive a 100% bonus up to 75.00 on your first deposit of $/£/€20 or more. BIG TUESDAY! From 00:00GMT until 23:59 GMT, all members are invited to receive a 110% bonus up to $/£/€220 on your deposits of $/£/€ 30 or more.